Missouri Education Watchdog: Are These Common Core Aligned Reading Materials Appropriate for 3rd Graders for Content and Message? Are These Common Core Aligned Reading Materials Appropriate for 3rd Graders for Content and Message? 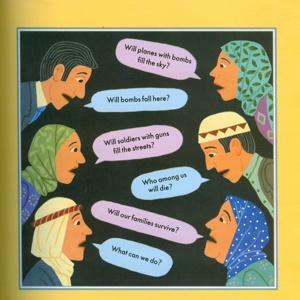 Illustrations from the book “The Librarian of Basra,” among the graphic war texts approved for New York third-graders. Tales of war, bombs and abduction — coming to a third-grade classroom near you. City and state education bureaucrats have given the green light to an English curriculum for elementary schools that includes picture books with startlingly realistic portrayals of war — to be read by 8-year-olds. They include “The Librarian of Basra,” which contains drawings of fighter planes dropping bombs on a palm-tree-lined Middle Eastern town. Similarly, “Nasreen’s Secret School” depicts the abduction of a young man from his home in Afghanistan by soldiers and discusses Taliban rules that forbid women to go out in public alone. “There’s no way in hell that I find it appropriate for third grade, let alone elementary school, on so many levels,” said a Queens elementary-school principal who was shown one of the books by colleagues outside the city. The books are part of a new English curriculum created by Expeditionary Learning, a non-profit arm of the group Outward Bound. The content was commissioned by the state Education Department for grades 3 to 5 as part of New York’s unique bid to adopt a statewide curriculum. Last month, that curriculum was recommended by the city’s Department of Education as one of two options for students in grades 3 to 5 because it aligns with new national standards known as The Common Core. Are these books recommended in your community? What are 3rd graders reading in your schools? Will these books make kids globally competitive? Are they emotionally appropriate for this age group? Are they content appropriate? Do they show any political bias? First, I'll name the things I love. As a raving book lover, I appreciate the subject of a librarian who loves books so much that she goes to such great lengths to save them. I love that others have enough respect for the books and the incredibly rich history of Iraq to help her. Like other reviewers, I love the example of this heroic and strong Muslim woman. She was literally saving history. This book has so much going for it. Unfortunately, I had two giant problems with this book. I just read all currently posted reviews (33 at present). I'm saddened that not one reviewer has pointed out two very significant lines of text on page six. "Government offices are moved into the library. Soldiers with guns wait on the roof." One reviewer who disliked the book's message even said, "If our service men and women did destroy a library, it was either by accident or because it was harboring Saddam's military goons or material." Well, yes, exactly, but somehow everyone who reviewed this book seems to have missed that very important piece of information. The library WAS housing government activity and those cowards knew that their country's books, indeed its very history, would then be in danger. They ran away from the offices in the library and left its contents behind to be bombed. Thankfully, this noble woman was there to save the irreplaceable. Unfortunately, because the author does not elaborate at all on this point, everyone seems to be missing it. Sadly, those most likely to miss the point are children, the intended audience. Many adults have reviewed this book noting how much they personally love it. That's truly wonderful and I feel the same thing about many of my kids' books but this book was, in fact, written for children and it does them a disservice by rushing past an extremely important point. The author had a chance to perfectly emphasize the abundance of courage that Alia Muhammad Baker showed. Originally, she was most likely worried that the library would suffer collateral damage. Indeed, she was worried about the library being lost to "the fires of war" even before the government offices moved in. Once they did, she had to know that the library would be an actual target and that a strike could come at any time once the war began. Her bravery for going back into that building to rescue books time after time even after the bombs started falling becomes even more laudable when viewed in this light. She was in very real danger because of those offices. Also, I would have liked it depicted that the books were being hidden from looters and vandals. Instead, it was clearly illustrated and stated that they were being hidden from soldiers. The only conclusion that those reading the book can draw is that soldiers would have destroyed the books. "The soldiers leave without searching inside. They do not know that the whole of the library is in my restaurant, thinks Anis." Heartbreaking and infuriating, period. I guess now is the time to mention that my husband is a soldier. My husband, who has personally funded my kids' 500+ book personal library and my ever growing book addiction, is a soldier. The fact that this book about such a noble woman was written and illustrated in such a way that children come away thinking that soldiers are the kind of people who intentionally destroy books is abhorrent to me. I'm so anti the Iraq war and anti-Bush I have a countdown calendar for his presidency on my kitchen counter. But I am the wife of a soldier and the mother of his three children and I am far too offended by the low points of this book to read it to my kids. Soldiers don't vote to go to war. Presidents order them to go, for better or for worse. Soldiers join the ranks to serve their country and hope that if and when they are ordered into battle that it is for a noble cause. And if the cause is noble, how grateful our country is to have them there. They don't get to pick though. Whether they agree or disagree, off they go without voice. I am my husband's voice tonight and I am offended beyond measure. For a moment, let's stop talking about politics and start talking about soldiers. Most of them are dads. My particular soldier wept openly when his babies were born, changes diapers and does pigtails like a pro, built a giant sandbox despite his intense distaste for sand, and has tickle fights and reads stories nightly...when he's not on 12-15 month deployments to a country he'd rather he had never set foot in. He probably knows more than 50 of our kids' books by heart, as he has been reading to them since the day they were born. He does voices that would rival the best audio books. He lovingly and perfectly tapes back together books with torn pages or loose binding, a fact of life for favorites. Every week I send a new kids' book from Amazon all the way to his trailer in Iraq, where he videotapes himself reading it. When the kids get their weekly Daddy video and their new book, that's the highlight of their week. Just picture their confusion if I were to read them this book. Now picture the child who doesn't know a soldier. There is no confusion, just the misguided notion that soldiers would have destroyed the books if they had found them. Please think twice before you read this to your kids. At the very least, be prepared to have a discussion about what the Iraqis perceive to be the American soldiers' intentions versus the reality of what the soldier is really there for. Soldiers don't care if there is a mile-high pile of books behind a door. They're simply hoping there aren't armed combatants ready to take their lives and prevent them from returning home to read their children some bedtime stories. While many are concerned about the war theme in this book, maybe this reviewer's comments create another concern: author bias and the unfavorable view of soldiers to 3rd graders. If you have children in school using Common Core aligned text, it is imperative to ask for the list in your district and review approved books for content and message. Here is a lesson plan from the other book mentioned in the nypost.com article, Nasreen's Secret School. Following is a review about the book that I chose because of the age of the reviewer's children and their emotional reaction. Is this appropriate for this age group? Should this be listed as a Common Core aligned reading list for 3rd graders? I was pleasantly surprised that both boys, 5 and 8 listened intently to the story but instead of my son being appreciative of the chance to attend school, my boys were both deeply saddened that the main character, Nasreen's parents were missing and that she had to sneak to attend school and was so sad that she never spoke. I thought that the book was a nice change from the standard children's books that usually read here in the US and perhaps the writing style was due to the translation and the fluidity of both languages being lost in translation but I felt in some areas of the book, the writing was a tad choppy - even for a kid's book and it was written a bit too simple if you will. I am still glad to have had the chance to share it with my kids although when I've offered to read it to them again, they both decline saying that this book makes them too sad. Barnes & Noble has this "Librarian of Basra" on display along with Common Core signs everywhere you turn. Why does everything have to be non-fiction? Also, the reading list my high school freshman received for summer was full of books carrying warnings for sexual content, violence, some graphic violence. Why? Anonymous, could you provide the name of your high school and the reading list? I would like to see the list and if others have lists available, please provide them. We should compile a list nationwide of what schools are providing students. My daughter was disliked by her second grade teacher. She was forced to read a very sad book three times. I remember being livid at the time and calling it child abuse. With Common Core, good teachers unwilling to abuse children with this material will simply be bullied out of the classroom. We will be left with teachers willing to do anything to keep the job, including reading this garbage.